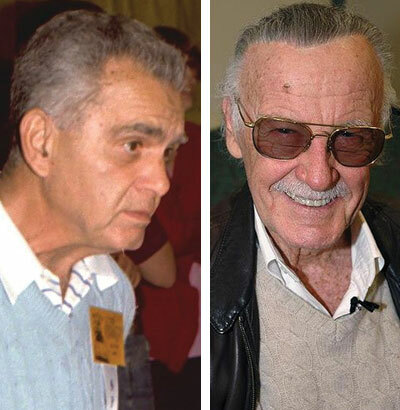 The King and The Man: Jack “King” Kirby (1917-1994) and Stan “The Man” Lee (1922): Creators of the Modern Comic Age. 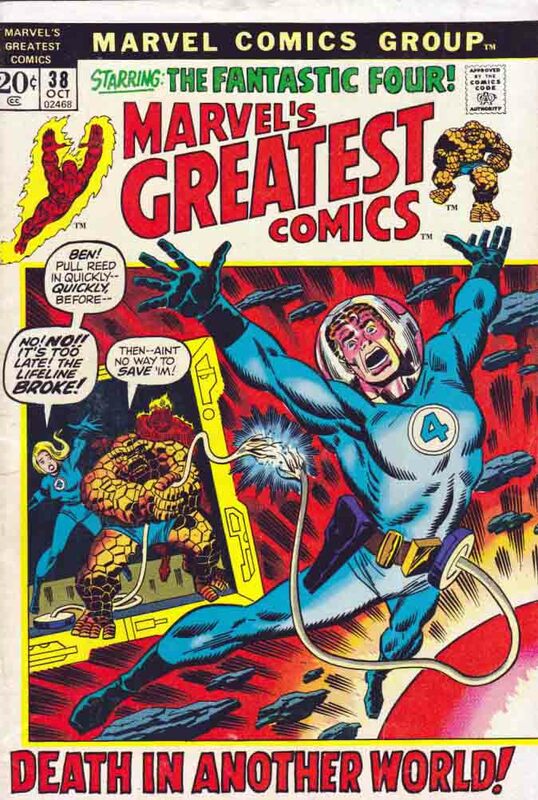 In our ongoing search for pieces of comic book literature that will still be considered worth reading—that is, “classic”—centuries from now, one might ask oneself where would Comicdom’s premier front man, godfather, and maestro, Stan Lee, and its foremost artistic innovator, Jack Kirby, rank? Will they and the works they created together in transforming the small Atlas Comics into Marvel, the world’s foremost and largest comic company, still be remembered and celebrated? And if so, which of the works that they created together are most likely to be reviewed and treasured (and perhaps even taught? 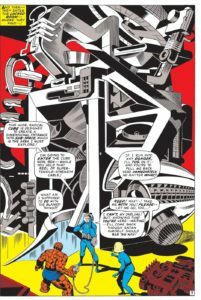 )—Avengers #1—Journey into Mystery #89—Fantastic Four #48-50? Of course, no one can say with certainty, today in the early 21st century, but from here in our boggy abode, we at TOP HAT know our answer to this question: a clear Marvel classic for us is Fantastic Four #51, which combined Lee’s greatest writing with Kirby’s (and Joe Sinnott’s!) greatest art to speak to the ages about the true nature of heroism. Fantastic Four #51 (June 1966): Kirby’s original cover brilliantly conveys the turmoil the Thing experiences in making his decision. 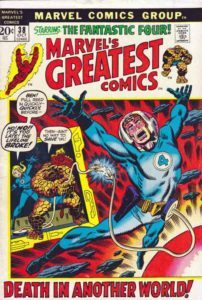 Marvels Greatest Comics #38 (Oct. 1972): Buscema’s cover for the reprinted story also conveys the terror of the Negative Zone, especially for our 5-year-old eyes. . . THE POWER OF THE REPRINT! Fantastic Four #51 Splash Page: This iconic splash page foreshadows the tragedy of the tale to come. 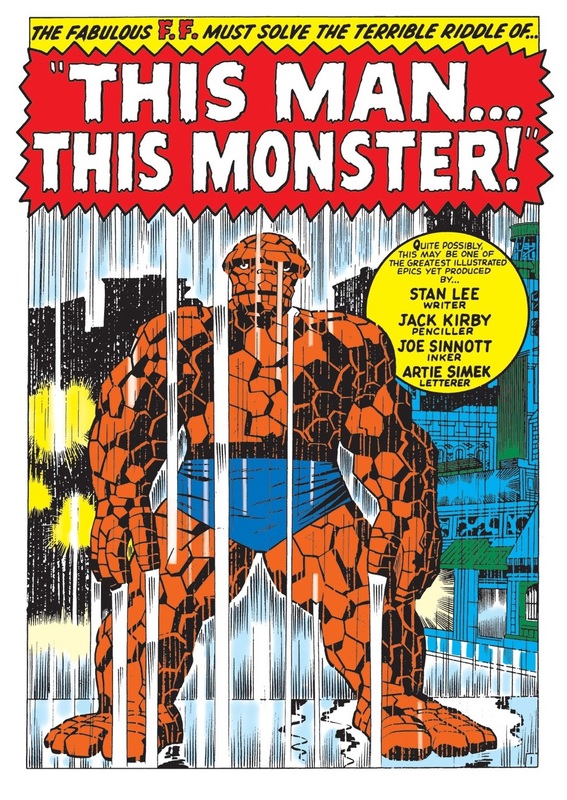 The splash page of the Thing standing in the rain sets the tone for the rest of the story. 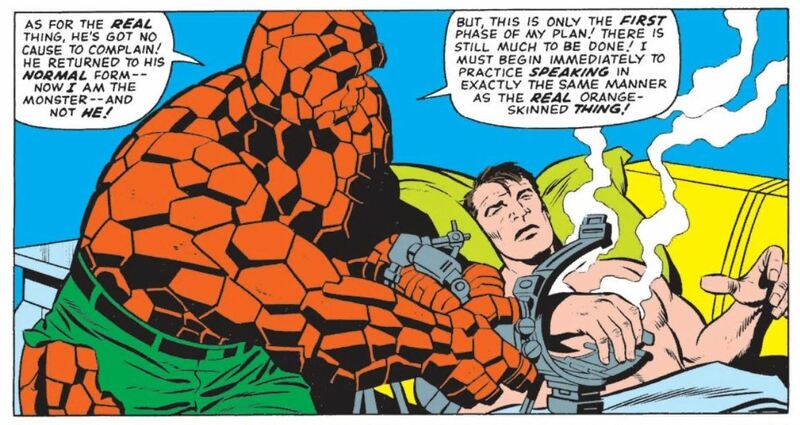 Ben Grimm is depressed because of his monstrous appearance (especially compared to that of the Silver Surfer in the preceding story arc). A man calls to him from a nearby building, offering him a place out of the weather and some hot coffee, which the Thing accepts. The man (whose name, Ricardo Jones, we only discover decades later!) 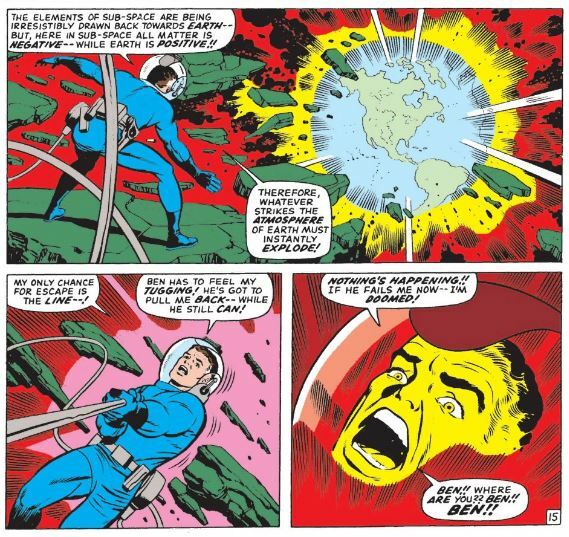 tells Ben that he too has been mocked for his work as a scientist and wishes he could be as great as Reed Richards. However, he does not reveal his hatred of the Thing’s partner, his jealousy and envy of Richards, thinking him a gloryhound. 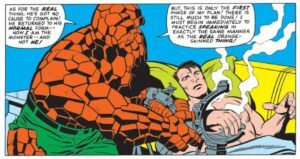 the unknown scientist hooks up a machine to Ben’s wrist, a machine which can duplicate another’s genetic code; using it, the stranger begins to transform into the Thing while the Thing turns back to Ben Grimm. 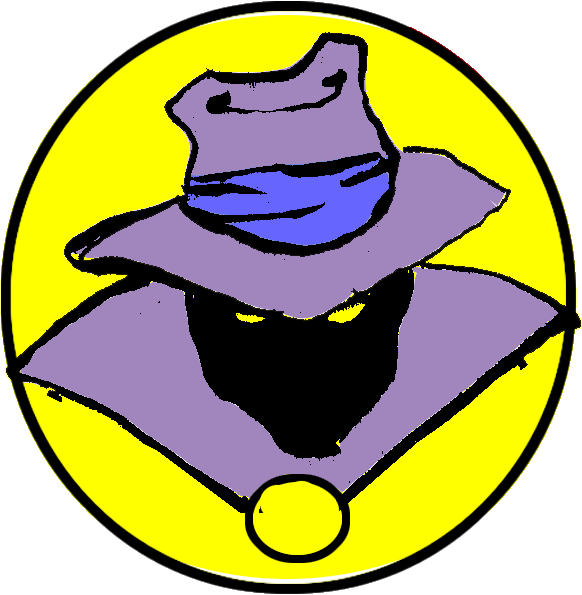 The unknown villain leaves the sleeping Grimm for the Baxter Building to enact his master plan. The transformation complete, the villain goes to enact his evil plan. Arriving at the Baxter Building, the Thing finds Reed working on another one of his inventions, a machine that allows sub-space—faster than light—travel. The fake Thing begins playing his role, helping Reed prepare for his excursion into sub-space. 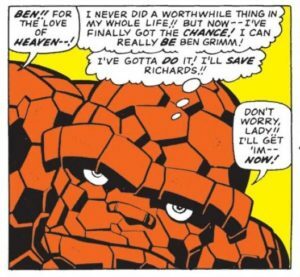 Just then, the real Ben Grimm, having awakened in the stranger’s apartment, bursts in, accusing the fake Thing of being an impostor. 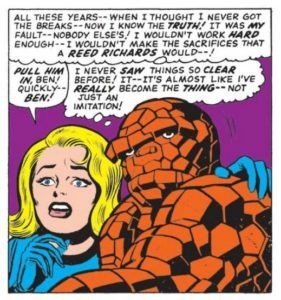 Reed and Sue, though amazed by his similarity to the real Ben Grimm, ultimately fail to believe his story and think him the impostor. Reed then prepares for his entry into sub-space. He relies on the fake Thing to haul him in if something happens. The evil impostor realizes that this is his chance to do away with Richards forever—all he has to do is not haul him in when he gives the signal. Into the Negative Zone! We don’t know about you, but when we first saw this, it scared the you-know-what out of us! Inside the realm of sub-space (later to be called the Negative Zone), Reed comes upon the point where matter and anti-matter meet, resulting in a terrific explosion. He realizes he needs to go back, or never return again. He signals to the fake Thing by pulling on the tether. Sue sees that the evil impostor is hesitating and urges him to begin hauling in her husband. 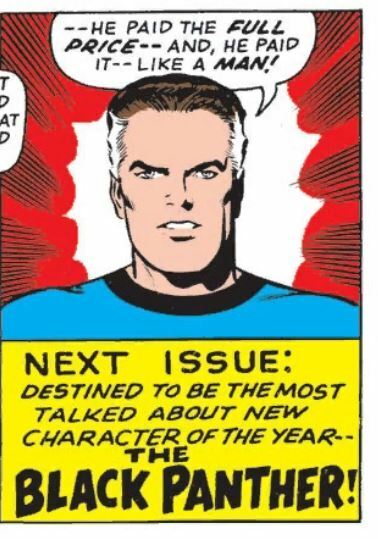 It is then that the fake Thing begins to undergo an epiphany, finally realizing that Reed Richards is great not because of his intellect—but because of his readiness to make sacrifices and use his intellect for the good of all which makes him heroic. The impostor decides to act as the real Thing would and save Reed—but it’s too late! The cord breaks, and the faux Thing chases it down into the portal and into the future Negative Zone, catching hold of it only as it pulls him too into its maw. Ricardo Jones Undergoes an Amazing Epiphany: Part I: The villain begins to understand that Reed isn’t Mr. Fantastic because he’s out for money and glory. . .
Jones’ Epiphany, Part II: To be great, he sees, requires hard work and sacrifice. . .
Jones’ Epiphany, Part III: Jones understands that he too can redeem himself. Ricardo Jones’ Epiphany, Part IV: The part when Jones finally realizes that maybe, just maybe, Reed Richards isn’t just some conceited over-paid gloryhound, maybe, just maybe–he really is a hero! As Reed shakes his old friend’s hand and tries to console him, the evil scientist within Ben’s body finally understands the true mettle of Reed Richards, as he wonders, “That’s the guy I spent years hating—being jealous of!! I—I aint’ even worth his little pinky! The Awesome Power of the Thing! 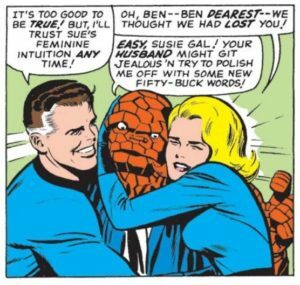 The climax of Fantastic Four #51, when the Faux-Thing uses his monstrous strength to throw Reed back to safety. We knew Thor and the Hulk were stronger, but this display of raw strength always impressed us. 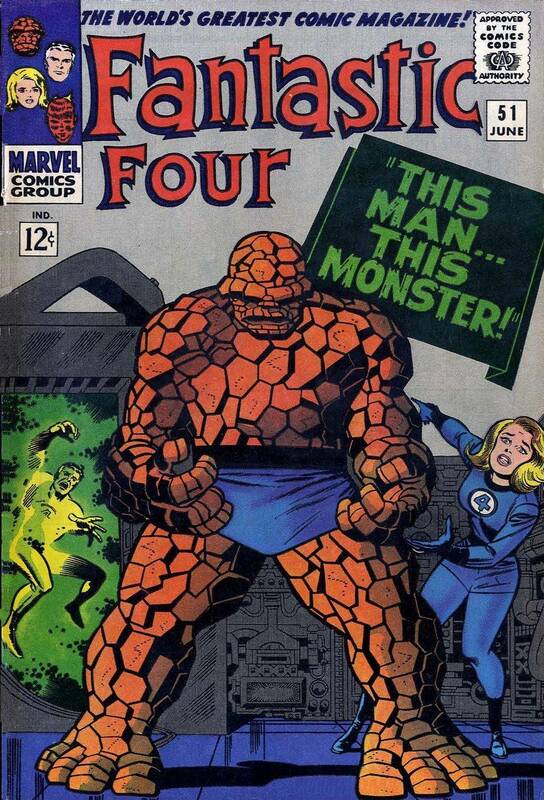 This version of Kirby’s Thing is also (in our view) the best ever, a cuddly, curmudgeonly monster. Byrne came closest to capturing this look during his run on the series. 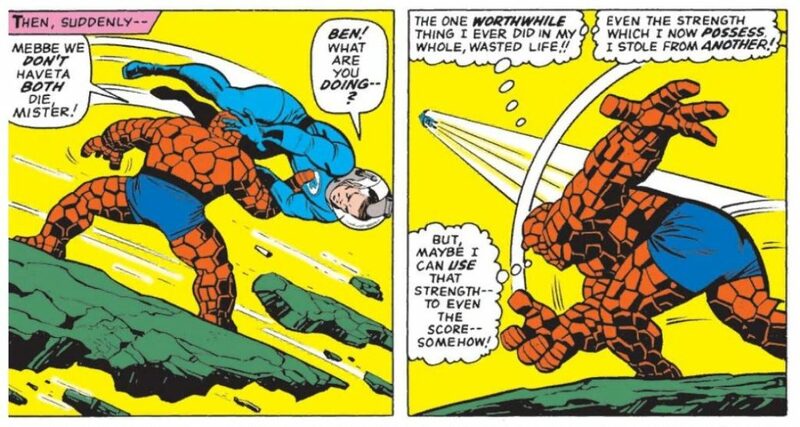 Then—suddenly—the faux Thing picks Reed up and—as easily as a man throwing a baseball—throws him back in the direction of the sub-space portal. The impostor accepts his fate as he nears the explosive atmosphere, grateful that he could make amends for the evil life he had led. At that very same moment back on Earth, the real Ben Grimm is about to knock on Alicia Masters’ door, nervous about how she will accept the human Ben Grimm. 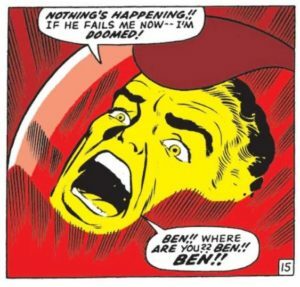 At the very same moment of the impostor’s death, Ben turns back into the Thing and races back to the Baxter Building to take care of the impostor. He finds Reed and Sue saddened by the death of the Thing, still thinking that the impostor who died was the real Thing. When they see Ben, they realize that it was an impostor all along, thus explaining his delay in pulling Reed back in. Even at our tender age, we realized that there was something special about this issue, even apart from the important theme of its story. Little did we know that we were not just looking at a stereotypical comic, nor a prototypical comic, but at an archetypal comic: that is to say, in this book all the elements of the golden standard of Silver Age comics came together: powerful visuals with crisp inking by Sinnott; bold reds and yellows that jump out from the page, and most importantly, some of the best art put out by King Kirby (which means some of the best art put out in comics ever!). Bonus Splash Page One: Kirby treats the readers to a page-sized picture of the first view of the Negative Zone portal. Bonus Splash Page Two: If one wasn’t enough, he gives readers a second. Heck, you could even tear it out and use as a poster! 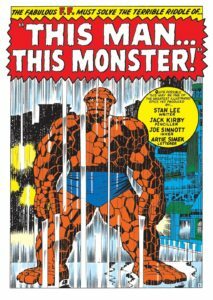 Reed’s Terror: So good are Kirby and Sinnott’s art that the reader feels Reed’s panic and fear as he realizes that Ben wasn’t hauling him back. We certainly felt it! Sprawled out there in our swampy home, little did we suspect that this was Kirby’s own Golden Age of art, that pinnacle of his career where even his own great mastery was at its very peak. 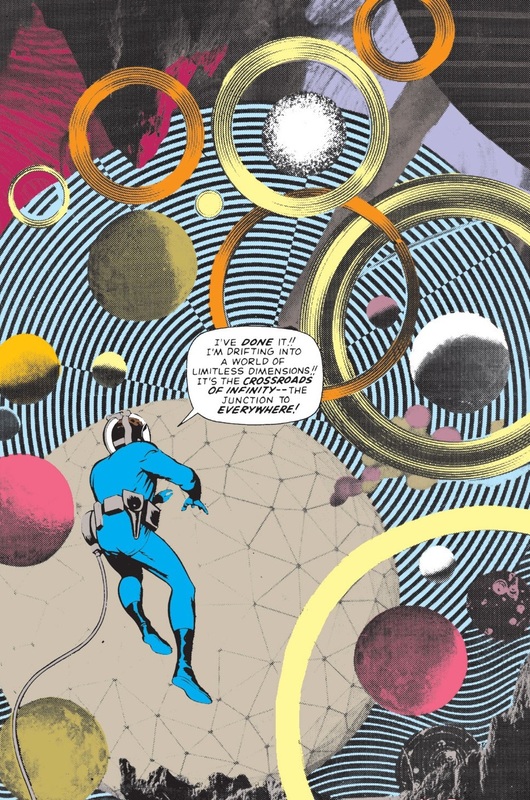 It is said (perhaps apocryphally) that during this time, Kirby was able to devote more time to his art: the result is eye-catching, to say the least. For roughly twenty issues (and that’s all! )—from approximately Fantastic Four #38 to the late 50s, Kirby and Sinnott turn out some of the best work they ever end up doing together for their entire run. 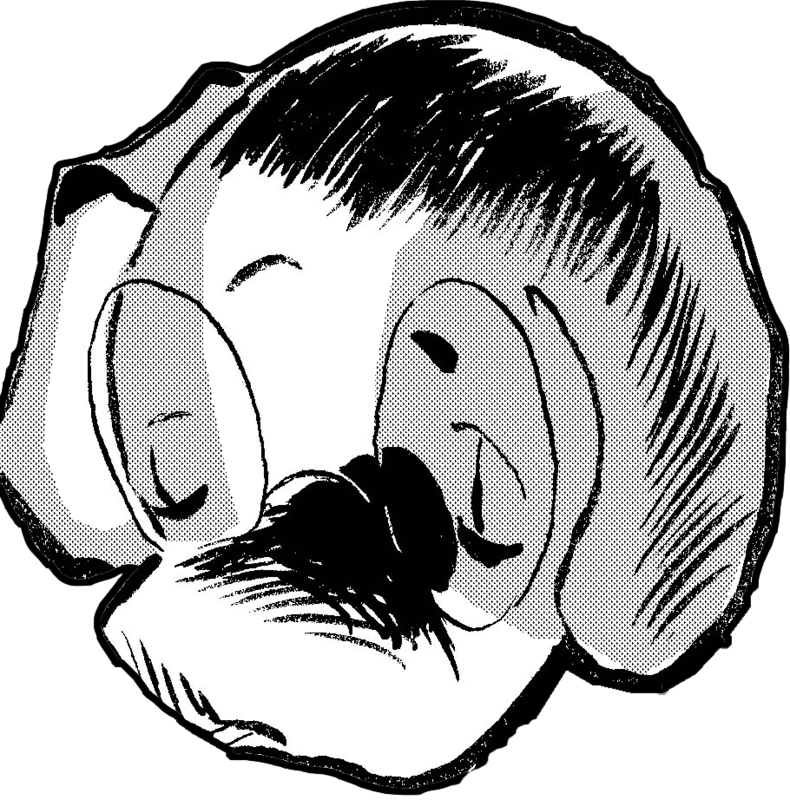 In fact, it almost doesn’t even look like Kirby. On top of the fantastic art are the awesome, mind-staggering scenes (of which there are many): the impostor’s transformation into the Thing; Kirby’s splash-page-sized pages of the Negative Zone portal and the first images of the interface between our world and the Negative Zone; the terror of the exploding rock belt above the Earth; the Thing’s unearthly strength as his hurls Reed back towards the Negative Zone portal; and the loneliness of the impostor-Thing as he sits patiently upon his rock—floating towards his destruction. Is it any wonder that such a story would so powerfully seize the mind of a 5-year-old? The End of the Fake Thing: Going, going, gone! Besides being mesmerized by Kirby’s art, we also felt the loneliness of the fake Thing as he drifted towards his death. A Joyful Reunion: Though the reader was in on it from the beginning, we too feel the joy as Reed and Sue realize Ben is still alive. At the heart of the story, however, beating and feeding the entire structure, is Lee’s story, the theme of which deals with the true nature of heroism. A hero is not necessarily the guy who’s so powerful he can move planets out of their orbit and turn back time itself, the hero against whom nearly every weapon is useless against his invulnerability (you know who you are!). Rather, true heroism results from total unselfishness, the willingness to do anything for the good of all, no matter what the sacrifice. Though ostensibly about the Thing, it might also be argued that the center of the story is Reed and Jones. 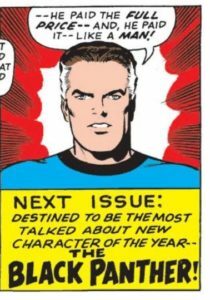 Reed is the leader of the Fantastic Four not because of his great intellect, but because he is willing to use that intellect and sacrifice himself for the good of all mankind. 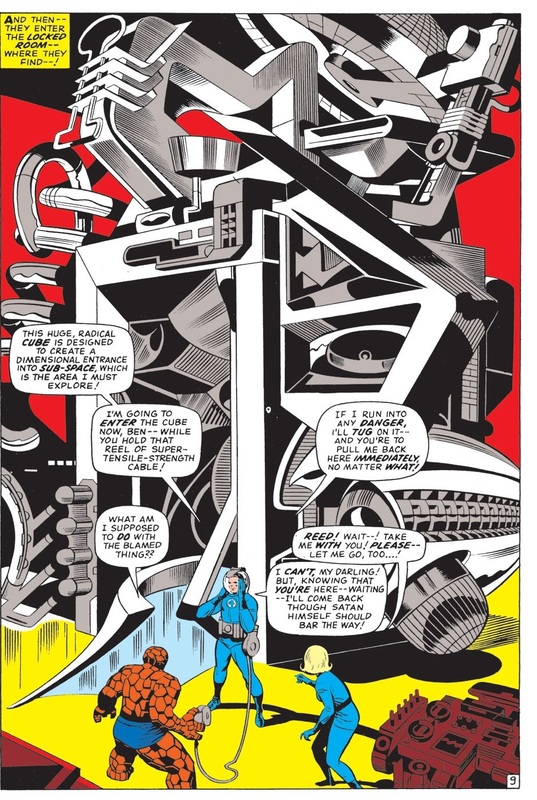 Even when the Impostor-Thing first comes upon him, Reed is laboring to create a machine that will protect all mankind from the menace of those beings that can traverse the speed of light, “Galactus, the Watcher, the Silver Surfer.” Lastly, this story is about redemption: Jones comes to finally understand the true nature of heroism and ultimately atones for his own crimes, redeeming himself in the process. It is said that Stan himself considers this his greatest story. It is easy to see why: some of the best art the field has ever seen; the eternal themes of love, hate, envy, epiphany, and redemption, as well as the definition of true heroism—unflinching selflessness and self-sacrifice. The reader also enjoys the characterization of the leading figures, the love and comradery of Marvel’s First Family. Combine all these elements with a nameless villain who might very well represent the evil that lurks in all men’s hearts, and you have the recipe for a comic classic. To this date, Stan has still not written the great American novel that he had intended to undertake years ago, but then with Fantastic Four #51, perhaps he (along with Kirby and Sinnott) has created a different type of masterpiece, a different type of classic literature—the perfect marriage of art and words—a comic book, an art form which we and many millions of other comic readers around the globe hold so precious.